It is that time of year again, Mardi Gras time! Book your hotel rooms today or else you will have no place to pee on Mardi Gras day. If you are looking for the perfect hotel then check out the Hotel Monteleone in the French Quarter. Walking distance to everything Mardi Gras. It is the only family run historic hotel in New Orleans and it is luxurious. Brian William’s from NBC news calls it his favorite place to stay in New Orleans. If you haven’t visited for Mardi Gras before, I suggest you come the week prior to fat Tuesday and first start in the french quarter. The french quarter is where all of the parties are going on. On the Friday before Fat Tuesday go to Arnauds on Bourbon at around 12am and checkout some of the walking parades like the Divas or Friar Tucks. When you want to venture out of the French Quarter to catch a few big parades you can walk down St. Charles where most of them run. 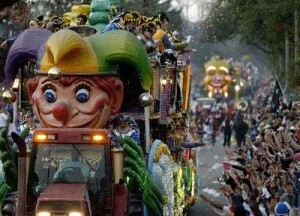 Here is a schedule for all of the parades around the entire city. This parade schedule is subject to change pending the City of New Orleans Official determination of the exact dates and times of Mardi Gras 2010. Krewe du Vieux – French Quarter, 7:00 p.m.
Perseus – Slidell, 1:00 p.m.
Oshun – Uptown, 6:00 p.m.
Atlas – Metairie, 6:30 p.m.
Cleopatra – West Bank, 6:30 p.m.
Excalibur – Metairie, 7:00 p.m.
Pygmalion – Uptown, 7:00 p.m.
Eve – Mandeville, 7:00 p.m.
Pontchartrain – Uptown, 1:00 p.m.
Shangri-La – Uptown, 2:00 p.m.
Caesar – Metairie, 6:00 p.m.
Sparta – Uptown, 6:00 p.m.
Pegasus – Uptown, 6:45 p.m.
Olympia – Covington, 6:00 p.m.
King Arthur – Uptown, 1:15 p.m.
Barkus – French Quarter, 2:00 p.m.
Rhea – Metairie, 2:00 p.m.
Centurions – Metairie, 5:30 p.m. Nemesis – Chalmette 2:00 p.m.
Dionysus – Slidell, 1:00 p.m.
Druids – Uptown, 6:00 p.m.
Thor – Metairie, 7:00 p.m.
Babylon – Uptown, 5:45 p.m. Chaos – Uptown, 6:30 p.m.
Muses – Uptown, 7:30 p.m.